And some of my gaze was internally focussed too. I was thinking about how much I’d enjoyed the jaunts I had in 2014. Some of them as lovely and sociable as this gathering. And also how much I was looking forward to some. hopefully. equally enjoyable (social but also solo) trips out next year. Quite a lot of the walks I do can be leg-stretchers (e.g 6+ miles) up on the moors above Marsden but I don’t add them all to this blog, as they are essentially ‘same-y’. Not for me of course: every change in the weather and sky, season, time of day, the mood I’m in, the specific Clough, Brook, Bog or Moor that I’m stood by: all these things make for a continuously varied, nuanced experience. But too many “I was up on Marsden / Binn / Close Moor” posts may be a bit dull for others. My walking buddy Brodie with Pule Hill in the background. One of those perfect days for a trip around the hills. That all said, the first ‘proper’ trip out (excluding a bit of a curtailed hike up above Dove Stone Res) was a local one. I devised a Marsden Poetry Trail that takes in around 10 miles of Marsden Moor. This was in early Feb 2014 and I’m still adding some waypoints to it now. Overflow for March Haigh Res – March Hill in background. On the Poetry Trail that I devised. The end of February saw myself, Jeff and Mac (mentioned above) as well as son Joe attempt K2. Well, Snowdon, via the Llanberis path. But a pedestrian hike it was not. Low cloud and a howling white-out made us, sensibly, stop before the summit. Why some others had carried on baffled me (some faint boot prints attested to that, as well as a party of shaken-up lads who came down behind us), there’s a time to quit in the face of raw nature. March brought the first of some training walks for June’s NSPCC HACK challenge. 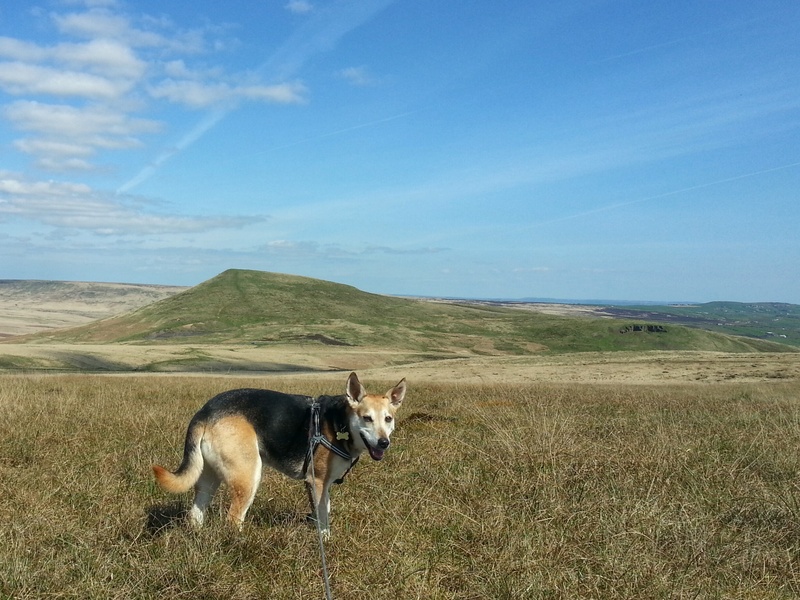 Walks included the Colne Valley Circular and a big chunk of the Kirklees Way. Both interesting routes that mix urban, suburban and rural landscapes. Moorland meets Industrial History. A ‘spin off’ of my walking this year was that I developed a real interest in the Mesolithic and Neolithic eras. The kind of stuff they didn’t teach us at school (although if they had, I would probably have been as disinterested as I was in Cromwell, Churchill et al). Education is wasted on the youth. Or something like that. This newfound interest, ignited by jaunts up to March Hill and also around the top of the (briefly drained) Wessenden Res / valley head, kind of grew as the year progressed. I know some flint artifacts have been found around both sites (disclaimer: no digging from me involved, just pondering) evidencing an earlier, quite different landscape. As well as that, I’ve spent a couple or more hikes ‘hunting’ for the stumps of 5000 year old trees up on Close Moss. So this hiking lark has cost me a bit in books: I now have a growing collection of ‘lay’ and also a couple of more academic prehistory books. From some great authors including Francis Pryor , David lewis-Williams, Vicki Cummings, Barry Cuncliffe.. and closer to home, Penny Spikins and Paul Preston. In June I kept the prehistory vibe going and managed to fit in three days on the Ridgeway Trail. It started down in Avebury and we took in various cairns and hill forts along the route. A trip I’m still thinking about with all that history and all those views. The trip also got me fitter for the NSPCC Challenge coming in June. And another ‘training’ hike (the 10 mile Marsden challenge) happened pretty soon after the Ridgeway ..
.. which meant I was in good shape for the NSPCC challenge at the end of June (which happened on a really muggy day). I returned back to the Ridgeway in September for the final day section (Wendover to Ivinghoe Beacon) ..
End of the Ridgeway at Ivinghoe Beacon. Happier than I look. I must try not to frown. .. and that and a hike that had Brimham Rocks as the start and end have been my longest walks for the remainder of this year unfortunately..
That’s because the back end of the year has been busy and with my wife still unwell, I’m conscious of not being out and about too much. That said, she came with me to stay at a friend’s cottage in Wales and I managed to get in a great (although not weather-wise) walk up above Cwm Penmachno. The recent Edale – Kinder Low circular was my last hurrah of the year, a great walk. So that was 2014: quite a mixed bag of trips out, when I look back on it. But all challenging, rewarding and / or engaging in different ways. I’m now planning or taking part in two jaunts to Scotland in spring next year and I know we’re due to head to Snowdon again, so hopefully next year I’ll see some new sights as well as revisit some great places. In the meantime, here comes Christmas. A fine year and a very fine Christmas jaunt Mr Kelly. Thanks for the blog, the photos and the video. I’m forever grateful to those who were brave enough to shed their gloves (or take to their keyboards) and make the effort to record the ocasion for us all to enjoy. I’m glad to have been part of it, even if only in a very small way.